I’ve never claimed to be an expert when dealing with cars, or anything mechanical, for that matter. However, I’d like to think I have a basic understanding of the general overview of a vehicle–i.e. how to check my tire pressure, how to check my oil level, and that vehicles run on gasoline or diesel fuel. Well, come to find out, I couldn’t be more wrong about that third point—not all vehicles run on gasoline or diesel fuel. As a matter of fact, a vehicle in my very parking lot at the office isn’t powered by either source, but rather propane, yes, PROPANE…the same thing that heats homes, fuels gas grills and even keeps swimming pools warm. While parking my vehicle at work, day after day I was curious to know whose vehicle I saw with a small propane tank in the bed of its truck. Well, a few days went by and I finally figured out that Charlie Hallquist was the driver of this “propane pick-up.” Of course this new technology intrigued me and I just had to sit down with Charlie to learn more. The bed of Charlie’s truck houses a 50 gallon propane tank. When I met with Charlie I didn’t even know where to begin—I had so many questions to ask him, as this whole idea was completely new to me! But, as it turns out, propane fueled vehicles aren’t a new thing at all. In fact, some 35 years ago Charlie worked for a company that had propane fueled school buses. There’s not much difference under the hood of Charlie’s truck since the conversion. Perhaps the biggest benefit Charlie is seeing is his reduction in fuel costs. With current prices on gasoline verses propane, propane is approximately $1.60/gallon less expensive than gasoline. While there is a slight reduction in efficiency while using propane, Charlie will still see an ROI on his investment in less than three years, based on the miles he drives each year and the cost of the conversion system. Furthermore, Charlie taught me that 78-80% of propane is a by-product of natural gas, which means it is becoming more domestic, thus not relying on foreign oils. Additionally, the conversion technology in Charlie’s truck is liquid injected and runs on liquid propane, rather than vapor. One small button on the dash is the only changes to the inside of Charlie’s truck. Of course, in my discussion with Charlie I was curious to know if this propane conversion could be done on any vehicle. Boy was I excited to know that this can be done on any vehicle, no matter the age, make or model of the vehicle—even lawn mowers can have this technology. Diesel vehicles can also be converted to propane, however, their process is slightly different due to the diesel injection. And yes, that’s right, even my little Chevy Malibu can be converted to run on propane. Charlie also informed me that the current conversion system in his truck can be transferred from vehicle to vehicle, when it’s time for a new truck. Now, you may be wondering where Charlie fills up his truck with propane. Well, that’s easy, Landmark, of course! These new vehicles that are propane fueled can be filled straight from a propane truck, or any place that fills propane bottles, such as RV’s. By the end of my conversation with Charlie I was sold on propane fueled vehicles, and I can’t wait to see where this new technology will go. With the significant cost savings, in addition to other benefits this sure seems like a win-win to me. Midwest growers take home prizes for BMR corn silage, corn silage, haylage and small grains. We are excited to announce the winners of the First Annual Producers Forage Bowl, held in conjunction with our Planting for Production Forage Producers Field Seminar last month in Stoughton, Wis. More than 100 forage samples were entered for analysis in the contest. Samples in the Producer Forage Bowl were analyzed in the laboratory by Rock River Lab in Watertown, Wis. with scoring criteria comprised of the lab analysis coupled with judges’ points awarded for look, feel and smell. Judges praised producers for the quality and consistency of the entries, citing resilience after the drought of last year’s growing season. BMR Corn Silage: 1. Statz Brothers Dairy, Sun Prairie, Wis.; 2. Crave Brothers Dairy, Waterloo, Wis.; 3. Vince Anderson II, Whitewater, Wis.
Congratulations to Statz Brothers Dairy for winning 1st place in the BMR Corn Silage category! Corn Silage: 1. Koehl Farms, Darien, Wis.; 2. Huebner Dairy Farm, Columbus, Wis.; 3. Kutz Dairy, LLC, Jefferson, Wis.
Congratulations to Koehl Farms for winning the Corn Silage category of the Forage Bowl! Haylage: 1. Junction View, Richland Center, Wis.; 2. JC Kow Farms, LLC., Whitewater, Wis.; 3. Chris Davis, Wisconsin Dells, Wis.
Congratulations to Junction View Dairy for winning the haylage category! Small Grain: 1. Davis Farms, LLC, Sharon, Wis.; 2. Bill and Randall Anderson; 3. Reedale Farm, Milton, Wis.
Congratulations to Davis Farms, LLC for winning the small grains category! The contest was free to enter and all participants received the laboratory analysis results of their entered samples. Winners in each of the four categories also received a logo’d jacket with the top three entries in each category receiving product from, Croplan, Landmark Forage Solutions and YieldEDGE. The Producer Forage Bowl was sponsored by Landmark Services Cooperative, Mycogen Seeds and Rock River Labs. Landmark and the UW Badgers team up to Celebrate Agriculture! 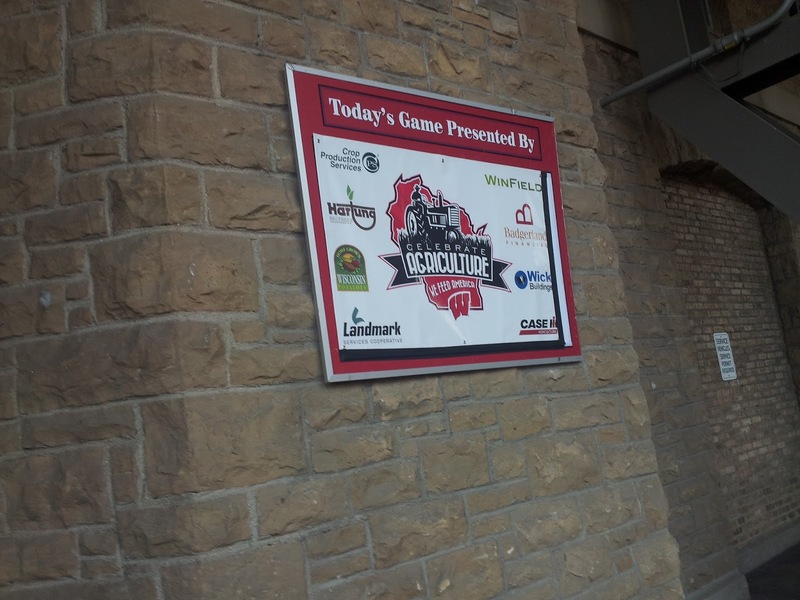 Landmark was so glad to be a part of the UW-Badgers “Celebrate Ag” day last week at the game! We are proud to be a part of an industry that feeds the world!